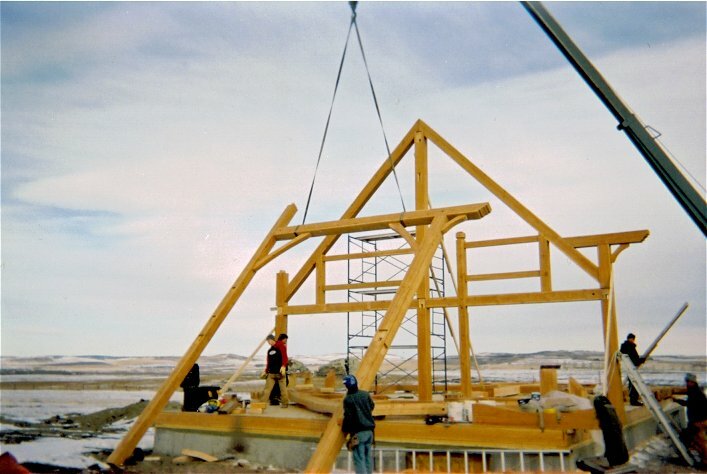 In earlier days, when cranes and vehicles did not exist, the raising of a timber frame barn or home was a huge event. Whole communities would gather together to help with the raising and celebrate it. The pre-cut timbers are transported from our shop in Okotoks to the site. These bents are then raised by the use of a crane and connecting plates are secured between them to complete the Timber Frame. Each bent can weigh upwards of 2 tonnes! The timber frame is now raised and ready to be enclosed. The entire family (and friends!) can come to watch, and even take part in, the raising of their own home. For more information on upcoming dates for raisings go to our News & Events page.